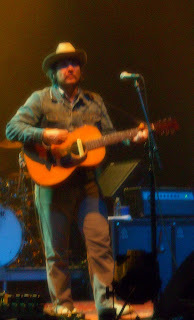 Elvis Enthusiasts Unite: Wilco in Grand Junction - 5/7/08. 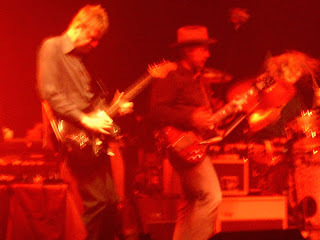 Wilco in Grand Junction - 5/7/08. I will drive five hours to Colorado to see Wilco in the middle of the week and not feel bad about it in the morning. In fact, I will feel better than I did the day before. I did feel better (save for the half pound of cheese chicken quesadilla I downed immediately beforehand—never again). There are others who will do and did the same (Kyle and Hoss and Linda being among the numbered) and, come to find out, those who sat directly behind us had also ventured over from the Salt Lake. To me, that’s an amazing thing. It testament to the kind of fans Wilco has created over time. Take a scraggly band of six that never had to depend on the crutch that is commercial radio, one that writes songs that are generally difficult to sing along to and mostly lack much of a chorus and really really tends to like its use of dissonance, and you’d never think it could sell out a converted movie theater in the fairly remote land that is Grand Junction. But they did it. And they’re doing it all over the Spring leg of their tour, too, one that also has them visiting the not-hotspots of Missoula, Montana, and Lawrence, Kansas. So, how was it? It was a concert that demanded we stand up and sing and scream and applaud and, yes, even dance (“I’m The Man Who Loves You” gets me every time). It was one that came with a couple much-needed encores. Tweedy and the rest played plenty of audience favorites, possibly every song off Sky Blue Sky and even a few requests made via their website (my “Jesus, Etc.” being among them). There were country songs and rock songs. There were guitar solos that threatened to melt our faces right off our skulls. There were touches of improvisational jazz all mixed up in that mid-tempo rock sound, too, believe it or not. It’s such a rarity to watch a band evolve creatively over the span of a handful of albums, allowing each player a piece of the respective pie; at some points Wednesday night, it was as if each artist was going a different altogether direction from the other five, but we had every confidence they’d end up on the same page again, regardless. And, the more they ventured elsewhere, the more we lauded them for it. It’s not the most common thing. It’s a win-win in the big weird world of music if I’ve ever seen one. 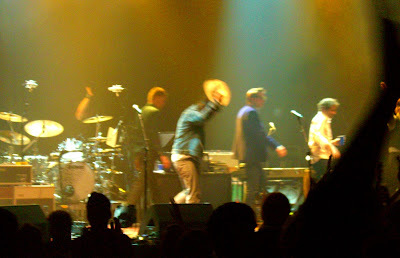 It was just my second time to see Wilco and, as second times go, it was nearly as good as the first. Grand Junction, on the other hand, was seeing them for the first time and I couldn’t help but almost wish I was that crowd. I’d felt the awe and satisfaction and thrills that they were feeling when I saw Wilco play the final concert of its tour at Kingbury Hall in 2004. Now it was their turn. Tweedy commented more than once that they were a “sturdier folk” than the band was used to, but that was okay. 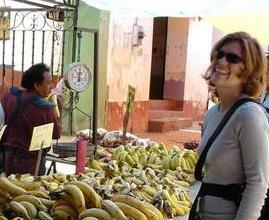 They were “mountain people” and “looked real healthy,” as far as he was concerned. This meant that, as Wilco built to a crazy kind of intensity to the show’s end with “I’m A Wheel,” two hours after it had started things off, the crowd matched it with its own energy really pretty well. By the end, it felt not unlike that scene in the Blues Brothers movie where they’re playing “Rawhide” over and over again to a bar crowd behind a protective chain link fence barrier. Bottles are being thrown and people are getting full on punched in the face. As far as I could tell, none of that happened, but Wilco could feel it all right. They answered by sharing smiles with one another, the equivalent of a brand-new band that gets the desired response to its months and years of work on its debut album, something along the lines of, “They like us! They really like us!” Only it was more than that. We flat out didn’t want them to stop. We loved the concert so much, we didn’t want it to end. For a couple stolen snippets of the concert, click here or here or here. Security was tight on this one and didn’t much care for my taping, but I got what I could. Do yourselves a favor and go see’em @ the Red Butte Gardens in August. It’ll sell out long before that date, so make your preparations soon. If you allow it to happen, the experience just might change you. Get there early enough and I just may let you share my blanket. You’ll find me near the front. This is a very nice love letter.